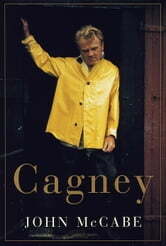 John McCabe's participation in the writing of James Cagney's autobiography, the many years of friendship that followed, and an intense period of interview and discussion in preparation for a musical comedy based on Cagney's life--a show that never saw the light of day--make him Cagney's ideal biographer. And, indeed, he has written a searching chronicle of this major actor's life and career, packed with history and anecdote, and profusely illustrated. Cagney came from a poor Irish-American New York family but once he found his métier as an actor, it was not long before he was recognized as a brilliantly energetic and powerful phenomenon. After the tremendous impact of Public Enemy--in which he notoriously pushed half a grapefruit into Mae Clarke's face--he was typecast as a gangster because of the terrifying violence that seemed to be pent up within him. Years of pitched battle with Warner Brothers finally liberated him from those roles, and he went on to star in such triumphs as the musicals Yankee Doodle Dandy (winning the 1942 Oscar for best actor) and Love Me or Leave Me. Even so, one of his greatest later roles involved a return to crime--as the psychopathic killer in the terrifying White Heat. He retired from films in 1961 after making Billy Wilder's One, Two, Three, only to return twenty years later for Ragtime. But however much Cagney personified violence and explosive energy on the screen, in life he was a quiet, introspective, and deeply private man, a poet, painter, and environmentalist, whose marriage to his early vaudeville partner was famously loyal and happy. His story is one of the few Hollywood biographies that reflect a fulfilled life as well as a spectacular career.